Listen to "The Black Widow" on your iOS and Android device. Gabriel Allon, the art restorer, spy, and assassin described as the most compelling fictional creation 'since Ian Fleming put down his martini and invented James Bond' (Rocky Mountain News), is poised to become the chief of Israel’s secret intelligence service. But on the eve of his promotion, events conspire to lure him into the field for one final operation. ISIS has detonated a massive bomb in the Marais district of Paris, and a desperate French government wants Gabriel to eliminate the man responsible before he can strike again. The book kept my interest throughout with interesting little twists and characters. I a looking forward to listening to his next. Yet another suspense by Silvia. Has not yet disappointed me. In this story Gabriel is not the main character, but the new female spy that Silvia introduces is just as fascinating and hopefully we'll read more of her in future stories. You cannot avoid falling in love with her. A truly enthralling story. I truly enjoy Daniel Silva's books. This book was fantastic but scarily so true to life. The addition of a new character in the Gabriel Allon series was fantastic and I felt she gives a whole new avenue for the stories to pursue. However, I miss Kiara, but understand as a new mother, her character needs to be with their children. Additionally, I absolutely love books narrated by George Guidal. He really knows how to bring characters to life whether they are male or female. 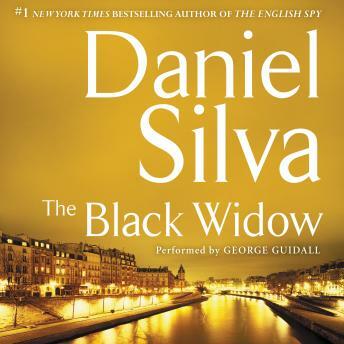 I love all Daniel Silva writings. His characters are well developed as are his storylines. It is not hard to accept the plot as a factual possibility. Also the continuing narration by Mr. Guidal keeps the characters true in your minds. How else would these people possibly sound. I hope these two gentlemen continue working together for years to come.